We’d like to congratulate DJ Gennie for her well-deserved win as the “Best Host” and for her program as the “Best Radio Program” by the Migration Advocacy and Media Awards of the Commission on Filipinos Overseas. She was in Manila last week to receive her award. DJ Gennie started hosting the “Multicultural Family Broadcast for Filipinos” in the spring of 2013 after DJ Regina left the show to settle in the Philippines. DJ Regina is now involved with private business as well as leading the project “Aklatan sa Kostal” ~ a privately-funded library located in the Bicol region. DJ Gennie works full-time as a counsellor for a government-sponsored call center. At her work, she provides valuable help to those in need of advice regarding work and family matters. She does not only help Filipinos in Korea but she also get calls from Koreans. Sometimes, she goes beyond by giving personal assistance when necessary. I sometimes wonder if DJ Gennie has the time to sleep. 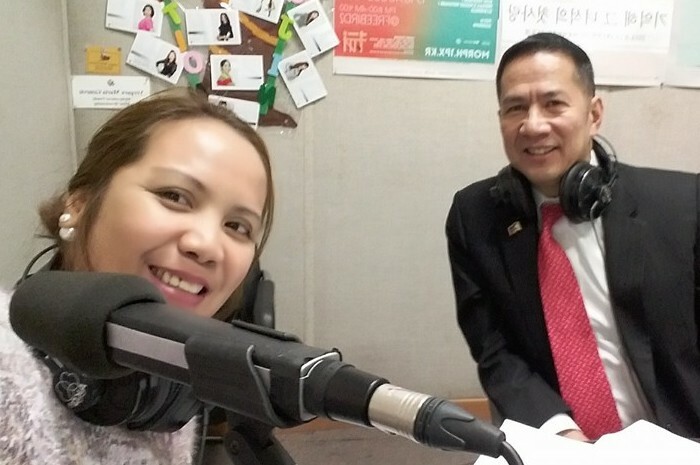 Aside from her work at the radio station and counselling center, she also assists in conducting surveys ~ like the one she did for the E-6 visa holders last year ~ and organizing events for the Filipinos in Korea. She gave voice to the entertainers who come to Korea by reaching out and getting their stories to the government. On weekends, she spends time with EPS workers at the Korea Port Institute in Incheon. I remember attending one of the EPS Forum she organized with Rep. Jasmine Lee. Despite the many long hours she spends working, the most remarkable thing about DJ Gennie is her commitment to raising her son by herself. She not only cooks for him but she also makes time to go out and enjoy their time together. She is both a mother and a father to the middle school boy. She is a reminder to fellow Filipinas that it’s not impossible to be working and still make your home. It’s just a matter of diligence and dedication. Whenever I see DJ Gennie, I always tease how big her eye bags are ~ but what I’m really saying is that how admirable she is for all the things she does. Her “eye bags” are like badges ~ the result of hard work and dedication to her commitment in being the voice of the OFWs in South Korea.